New Yorker Electronics is carrying the newly enhanced Vishay BC Components 500 PGP-ST series of aluminium screw-terminal capacitors. This new model now has an improved maximum voltage rating of 500V. These new devices possess the same 5000h lifetime at +85C as the other voltage ranges, which were upgraded from their previous 2000h lifetime at +85C. The device has been optimised for DC-Linking in power conversion electronics rated at 20kW and above and are provided with 8mm terminals. Cases are cylindrical and aluminium insulated with a blue sleeve and pressure relief in their sealing disc. They are also offered in seven case sizes ranging from 50mm x 80mm to 90mm x 220mm. As polarised aluminium electrolytic capacitors with a non-solid electrolyte, the devices are perfectly suited for power applications and pulsed power applications, which necessitate high energy storage in a small form factor. 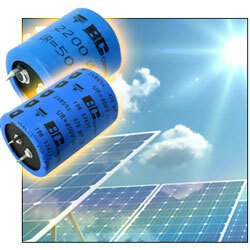 The company also supplies the standard voltages in 400V, 420V and 450V.